During the summer between my sophomore and junior years, I worked as a paid researcher in the Tennis Dynamics Lab for the Court Pace Rating project. The motivation behind this project was to find a cost effective way of measuring the speed of tennis balls before and after an impact with the court. If the ball is to be fired at a prescribed angle, then the change in velocity after impact can be used to quantify and compare different tennis courts. This is particularly useful when tennis courts are layed, and the client wants certain bounce characteristics. 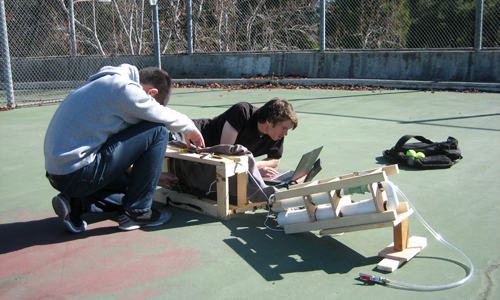 Testing our prototype on a tennis court. Corbin on the right, and Yisi, a new member, on the left. Section cut of the wooden proof of concept. 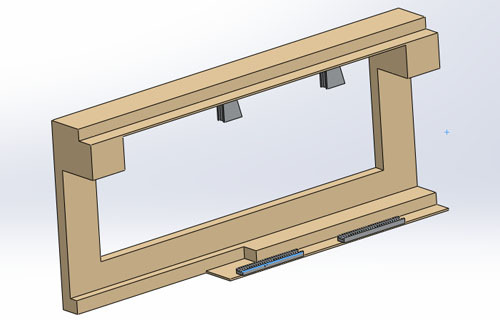 Two holders for laser modules above, and two rails for light sensors. 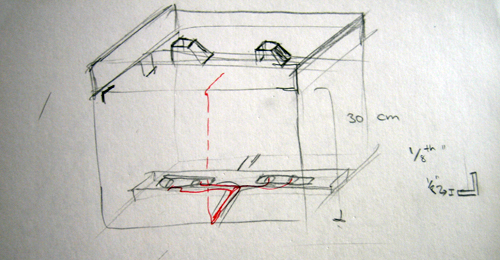 To measure the inbound velocity, light gates have been integrated into our air cannon (not shown). These drawings were made after construction for documentation purposes.